I was a child of the ’60s. And by that I don’t mean my parents were hippies who raised me in a commune and took me to Grateful Dead concerts. (We’ll talk about Grateful Dead concerts another day.) Far from it. My parents were Cuban immigrants who fled the Castro regime in 1960. They were young, newly married, ambitious, and apparently, quite eager to raise a family. By 1966, I was three years old and had three siblings. Being a child of the early ’60s meant I was a teenager of the ’70s. And a college student of the early ’80s. As a late-season baby-boomer and the over-achieving daughter of first-generation immigrants, I saw just one path before me: get a business degree, get a job, get promoted and get rich. Or at least, really, really comfortable. Truth is, all of that excited me. I loved college, loved the career I ultimately chose (marketing) and loved the business world. I was successful at it (by my standards, anyway), earning those promotions on a regular basis and reaching the executive level, albeit at a small company. It’s been a fabulous, close-enough-to-30-year run. But do the math and you’ll quickly figure out that I have reached the ‘youth of old age,’ as Victor Hugo put it. Fifty hit me like a ton of bricks. Or more accurately, like a brick wall. 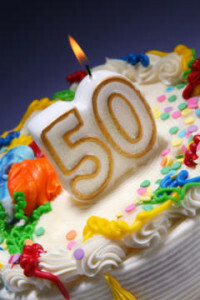 Upon turning 50, I suddenly realized it’s time to stop running so fast to secure my future. The future is here, dammit! It’s time to start living it. No, the brick wall isn’t about the number itself. It’s about a confluence of circumstances making me realize that it’s time to stop running so fast to secure my future. The future is here, dammit! It’s time to slow down and start living in it. For starters, I hit a wall at work. For three decades, I was driven to advance. Take on more responsibility. Tackle bigger challenges. And ultimately, earn more money to save up for that far-off “future.” The year before I hit 50 was the most productive year of my career. I knocked out big goals, and inspired and coached others to do the same. When the year ended, I thought… what now? Advancing to the next level would mean running a company or leaving my comfortable job of 10 years to work even harder, and prove myself one more time, at a bigger company. No, thanks. Then there are the lifestyle-induced maladies seemingly arriving by the busload. I am ‘high’ and getting ‘higher’ all the time. (Once again, not the hippie kind.) High blood pressure. High cholesterol. High blood sugar. High BMI. High stress. The cure for all is more exercise, a healthier diet, and taking better care of myself. There always seemed to be plenty of time to self-correct before things got too risky… until now. And so, with the unwavering support of my husband and best friend (one and the same person), I’ve decided it’s time to begin planning my exit from the so-called rat race. To start slowing down, focusing less on work and more on life, and reaping the rewards of all that hard work while I’m still young (for an old person). Preferably in a camper of some sort, vamped to my liking, with my best friend at my side. Curious about where this will head? Me, too. Feel free to come along for the ride… the more, the merrier! Have you hit a wall that made you rethink your goals and priorities? What are you doing about it? Do you have any advice for me? Leave a comment! Very nice, I can’t wait to see more! When I read your introduction I thought how much I feel the same way! So I am waiting for your next bits of information so I can get on track! Wow, thank you, Tonja! And welcome — it’s so exciting to see new people find my blog! Are you in a similar phase in your life?